I love getting images printed on canvas. It is such a beautiful way to share those special moments with everyone that visits your home. With Alive on Canvas the possibilities are endless. Start with a canvas and add person photos, clothing, shoes, jewelry, memorabilia and more! It is a unique and whimsical form of 3D art that captures those precious memories in life. Enter to win your very own canvas below! 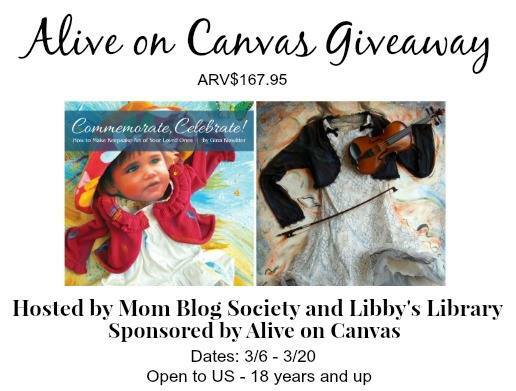 This giveaway is sponsored by Alive on Canvas and hosted by Mom Blog Society and Libby’s Library. Winner will receive a book and a 16 x 20 pre-made canvas of their choice. Retail value $167.95. Giveaway ends March 20, 2015 at 11:59 pm EST. Giveaway is open to US only, ages 18 and older. Enter to win via the entry form below and good luck! Disclaimer: This product was received from the Company for review purposes only. All thoughts and words in this post is my own and I was not paid to endorse it. I am only voicing my opinion about this product. Giveaway Bandit is not responsible for prize fulfillment. This would be a perfect for gift for my daughter.thanks so very much for sharing. I love their selection and would like to liven up my walls. I think it would be good in my house. I would love to have this in my living room, a canvas is a great way to display a awesome memory. What a creative way to capture precious memories in life. I would love to win this wonderful because I have lived at my house now for a couple years and I still don’t have much on my walls they need you gorgeous art!!! I would like to win this as it would be perfect for my children’s pictures to remember them at this age. I would love to win so I could get started on decorating my room! This would be perfect!